O2 and CO2 Analyzer for research processes, gas blending, biotech, and other systems. The Model 902P O2 CO2 analyzer measures 0 to 100% O2 concentrations, and 0-1% to 0-100% CO2 vol/vol full scale, in a variety of process, research, and biotech applications. Options include internal sample pump, battery operation, analog outputs, and complete data collection option (including analysis software for long term experiments). Sample flows into the analyzer through the front panel fitting, and vents out through an exhaust port on the back panel. The exhaust port can also be equipped with a connectible luer fit connection, should you wish to keep your system closed. The recommended flow rate is 50 cc/min, although the analyzer can accept 10 to 1000 cc/min without adversely affecting the response time or readings. The sensor operates at atmospheric pressure, and a flow bypass in the internal plumbing arrangement allows for excess pressure to vent. This allows for higher acceptable flow rates, without affecting the accuracy of your measurements. NO SOURCE OF FLOW OR POSITIVE PRESSURE? NO PROBLEM. 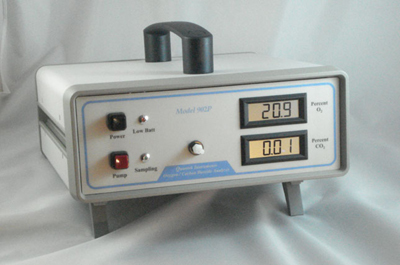 For systems where a source of sample flow (or positive pressure) is not available, the Model 902P can be equipped with an optional internal miniature diaphragm pump with an on-off switch on the front panel. This pump draws about 5 cc/second from your chamber, experiment, room, or system. The pump is electronically controlled to operate only when sampling, and can be adjusted to run for 2-12 seconds per button press. Furthermore, if you equip the analyzer with the pump, you can still introduce sample directly into the inlet fitting without pressurizing the analyzer or affecting your readings. The pump is electronically timed to draw in the amount of sample required for the analysis, and then turns itself off after the pre-set sampling time (2 to 12 seconds). Advanced optional pump controls include two mode pump switch (for continuous pump or timed operation), cycling pump (set to run for x seconds on, x seconds off), or concentration activated pump (pump turns on when O2 or CO2 goes above or below preset limit). While the sample introduced should be clean and dry (non-condensing), should moisture enter the analyzer, the Model 902P is equipped with an internal moisture trap filter. This provides a last barrier of protection, and is user-replaceable (we provide spares). The Model 902P uses a solid-state infrared CO2 sensor which has no moving parts, a compact optical cell, and microprocessor-based calibration factors using a 6th order polynomial equation to linearize the full range measurement up to 100%. Infrared CO2 measurements are inherently non-linear, especially over a high range of concentrations. The math algorithm used in the 902P yields more accurate results over a much wider range of concentrations than other methods. The expected life of the CO2 sensor is theoretically unlimited, as it contains no moving parts. The Model 902P CO2 sensor combines cutting edge 32-bit digital signal processing with the solid reliability, compact size and state of the art microprocessor technology that makes this full-featured CO2 measurement system less complex and more robust than other instrumentation. The Model 902P uses a long-life heavy duty electrochemical O2 sensor, with an expected lifetime of 5 years. Other electrochemical O2 sensors have an expected life of 1-2 years. Both the CO2 and O2 sensors are unaffected by high levels of background gases such as nitrogen. The O2 sensor is unaffected by high levels of CO2, and vice versa. With its low power requirement, the Model 902P can be operated with an optional battery for those applications where AC power is not readily available, or for convenience if spot checking samples at different locations. A totally sealed, long-life internal 12 Vdc battery accepts a full or partial charging cycle and will operate the unit for up to 8 hours. The charger module plugs into a standard 110-240V outlet for charging or continuous operation. Alternatively, the unit can be powered from an external 12-24 Vdc source. The Model 902P is backed it up with a two year warranty, twice the industry standard. The advanced design allows an output requiring less frequent calibration. It provides a stable, drift-free linearized voltage or current output that is much less susceptible to external electro-magnetic interference than conventional analog electronics. CO2 Calibration Frequency: Every 12 months; calibration gas recommended. A – double orange connector (1/16 ID tubing) – useful if you choose to inject sample gas into the inlet of the analyzer using the supplied 60 cc syringe. B – Two particulate filters – These leur-fit filters can be attached to the inlet fitting of the analyzer to provide extra protection from particulates. C – T style connector – This fitting is useful as a flow limiter – by passing your sample gas through this fitting, and leaving one of the T stems open, you can reduce the flow reaching the analyzer. D – Inlet fitting (accepts 1/4in ID tubing) – This is a replacement spare for the inlet fitting in the event that your original fitting is damaged or the threads stripped. E – Adjusting screwdriver for potentiometers – This screwdriver fits the potentiometers on the back of the analyzer. F – Rubber Washers – These are replacement rubber washers. One is already installed behind the inlet fitting to provide a leaktight seal. G – 60 cc syringe for sample injection – Useful for syringe injection. Note, however that this method may require at least 120 cc of gas to get a proper reading. H – 1/16 ID tubing – This tubing can be attached to one of the orange hubbed needles, and affixed to the inlet fitting. I – Internal inline moisture trap filter (PTFE .45 micron) – This filter is a replacement for the inside particulate and moisture filter in the analyzer. Should you accidentally allow moisture into your gas flow, then find the readings not to change as expected, then you may need to replace this filter inside the analyzer by removing the top cover. This is a four layer filter which will completely block gas flow upon saturation. Internal Pump – A mini diaphram pump installed inside the analyzer, and draws approximately 5 cc per second. Great for situations where there is no source of flow. Expected -pump lifetime is 8-10 years. Analog Output (vdc) – Terminal strip is provided on the back of analyzer to attach to your own data acquisition equipment. The concentration measured is proportional to the analog output, and can be modified to fit your system with a full scale of 0-1vdc, 0-5 vdc, or 0-10vdc. Analog Output (4-20mA) – Similar to the vdc output, we can provide a current output with a linear signal proportional to concentration. This option is useful for very long cable runs, as a break in the cable will be detected by your data collection equipment. Two Mode (Continuous) Pump Switch – Enables use of the pump in two modes – one mode is clicked “on” and leaves the pump running until unclicked. Pressing the switch lightly enables operation according to the user adjustable potentiometer timer. Cycling Pump – An internal circuit control allows you to program the pump to operate for x sec/min/hr and then rest for y sec/min/hr. This is especially useful for long term experiments where you do not want the pump to operate continuously, but want a fresh sample drawn in occasionally. We set it at the factory, but you can change it later. Most customers choose roughly 5 minutes on, and 55 minutes off, to run experiments over the course of days. Data Logger – Our data logger includes everything you need for collecting analysis data from our benchtop analyzers. For analyzers with a vdc analog output installed, the data logger is used to collect measurements for offloading to a PC or Mac. Fine .01% Resolution – An extra digit of resolution can be provided for applications where accuracy is of the utmost importance. Please note that for 0-20% CO2 analysis range, we can provide this at no additional charge. Recirculating Exhaust – Connectible 1/8in leur fit outlet at exhaust port enables re-capture of gas for closed systems. Swagelok Inlet – Installed brass Swaglok inlet fitting for compatibility with your existing equipment.